Happy Halloween to all. It's a bright, clear day in Walnut Creek, and will be a chilly but gorgeous night for the kiddos out trick or treating. We expect our usual horde of trick or treaters tonight; Mom's bringing over a beef stew cooked in a pumpkin, I'm baking fresh bread, one of our kids has rehearsal, the other is possibly either having friends over or going to a friends house - so my main entertainment will be eating good food and looking at the little guys who come to the front door. Meanwhile, there's been all sorts of interesting things and surprises happening around here. One is the above persimmons - a neighbor had an excess from her trees, so we promptly picked up a bin-full. We wanted to make jam, but it seems that it's not totally safe to water-bath can this particular fruit (acidity is questionable), so there is a dearth of recipes, even if we just want to freeze it after making it. We found one from a middle-eastern woman that seemed promising, but used cornstarch to thicken, and the end result was terrible. That was sad, after Tom put in all the work of making jam. I'm going to try again with some pectin, though persimmons are naturally high in pectin, so maybe I'll skip that addition. We also wanted to make Hoshigaki, but I haven't gotten around to that yet. ... while in others, it's extremely spotty. I think it has a lot to do with temperature and water. This is winter wheat, so it needs cooler temps, and last week we were in the 90's for days on end. Plus, drip irrigation can be tricky with germination, so sometimes the seeds rely on me to get them damp, and sometimes I forget or lose track of what I've done and when. So I'm hoping, now that we've cooled down, and the winter rains are on the way (fingers crossed), we'll start to see a thicker stand of wheat. "Stand of Wheat." Gosh, if that doesn't sound all Pa Ingalls. Next I might hit you with "the wheat is now tillering," and that will be a secret thrill for me, probably not for you. Leeks, garlic, shallots, peas, spinach, kale, lettuce, chard, beets, carrots, broccoli, cauliflower, cabbage, Brussels sprouts: All doing well. Had my first crop of greens today in a frittata for lunch. And just saw my first pea on the vine, though that deer that crashed through ate the tops off most of them. That's ok, they're recovering. We've also had some fun surprises at the water feature too. A couple of days ago, I was sitting near the bee hive, watching the activity there, when I noticed a new-to-me bird land for a drink. After some research, I determined it was a Hermit Thrush. It's an extraordinarily adorable little bird. Then, this morning, as I was out brushing egg sacs off the kale (cabbage butterflies; controlling their caterpillars is keeping me busy this year), I heard an interesting new bird call - sharp and short. 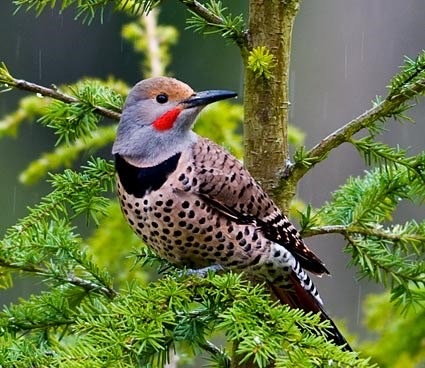 I quietly skulked around to the water feature and there, in the tree above, was a Northern Flicker (red-shafted western). This bird was not exactly adorable - it was BIG and LOUD and striking!!! Wow! 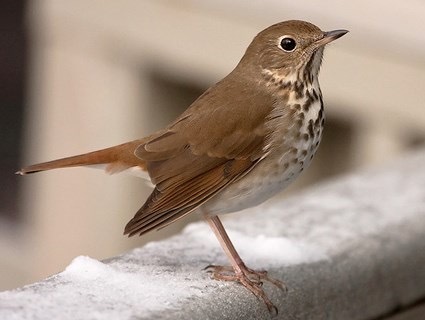 Some research tells me that these birds are both common here, though the Hermit Thrush only in winter: We've never seen them in our yard, so having them here now is very exciting! Both eat insects and also some berries. I did have one surprise this past weekend which was not so great. I opened up the smaller compost bin (the one I call the worm bin because I add worms every couple of years - it's not big enough to get hot enough to break stuff down) to dig out the worm castings to sprinkle on the wheat beds. As I began, a couple of rats leapt out and streaked into the neighbors yard. I thought that was pretty gross, but continued my chore. When I was near the back I uncovered a baby rat nest with three newborns in it. I don't like rats, and I've put out those snapping traps to kill them when their numbers are too great, but it was another thing altogether to disrupt a nest and put babies in danger. I know it doesn't make sense, but I closed up the compost bin and went into the garden and sobbed my heart out. Ugh. So, not all surprises are good. I went ahead with my fall cleanup and made a HUGE pile of branches to continue my effort to attract snakes. We need something to take care of the rat population around here and I certainly don't want it to be me, no thank you, I don't want to kill babies of any kind. I guess it's that old adage that if it's out of sight, it's out of mind. Anyway. I don't want to leave you with an image of rats, even if it is Halloween, and I don't want you to think I'm an evil baby-rat-killer either. So, the bread just came out of the oven and I'll bribe you with images of that, instead.